Auslogics BoostSpeed for Windows 7 allows you to quickly optimize your computer. The functionality of the program includes cleaning the registry, monitoring the installed applications. System Adviser module includes 50 tests with benchmarks, which makes it possible to verify the operation of the system. The software will speed up the Internet connection, conduct DNS caching and configure browsers to ensure maximum processing speed of web pages. Available option of blocking pop-up ads and Optimizer work to Microsoft Office Tools. 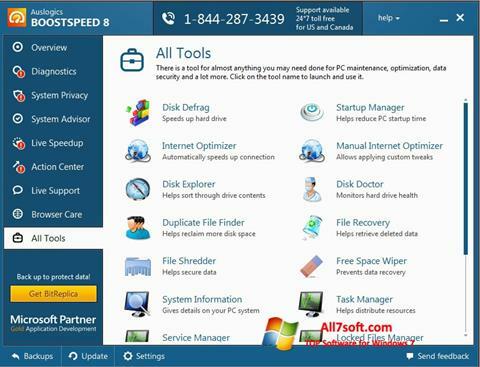 You can free download Auslogics BoostSpeed official latest version for Windows 7 in English.